24 Hours in Watford City: Let’s Go! Watford City, North Dakota, otherwise known as “The New Frontier”, is a mecca of outdoor recreation, entertainment, and excellent dining. The 12th largest city in North Dakota, Watford City is the gateway to the country’s most beautiful natural sites, including Theodore Roosevelt National Park, the Maah Daah Hey Trail, and Badlands National Park. With so many activities and top-rated restaurants at your fingertips, we’ve broken down our favorites in Watford City. Get ready to make room for awesome – you’re in for a wild ride! There’s no time to waste over the next 24 hours – there are things to do and fun to be had! Get an early jumpy on the day and rise with the sun. Fuel up for a day of adventure at Little Missouri Grille where you’ll find classic diner favorites including piping hot coffee and Watford City’s best biscuits and gravy. We’re drooling already. Looking for a specialty coffee and pastry? Make sure to check out Door 204 Coffee, located on Main Street. Post-breakfast and morning coffee, it’s time to hit the road for your morning adventure to Theodore Roosevelt National Park. 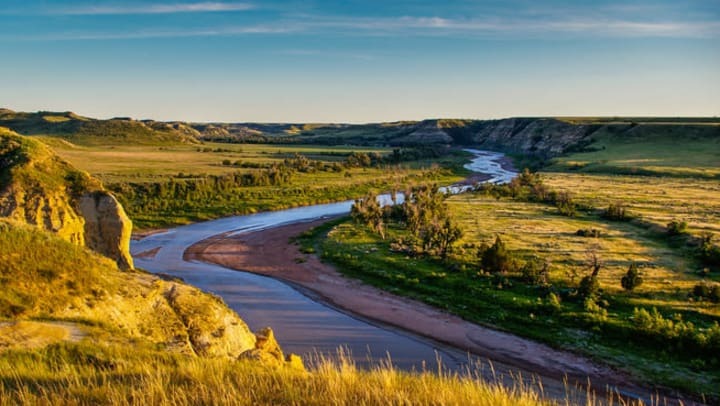 Just 15 miles from Watford City, you’ll find yourself entering the North Unit section of the park located in the Badlands of western North Dakota. Within the park, make sure to check out Longhorn Pullout, one of the first stops as you enter. As the name implies, you’ll find the park’s small herd of longhorn steers roaming the area. It may be tough to see them from a distance since it’s such a large area for them to roam, so make sure to bring along a pair of binoculars. Cannonball Concretions Pullout is also a must-see sight within the North Unit. Find large stone cannonball formations steps from the parking area, and even more if you decide to hike in a bit. Beware; you may even come across wild buffalo! If you’re in the mood for a good hike with amazing sights, River Bend Overlook tops the list. Located in the North Unit, you’ll find this easy hike touting beautiful views from the top. The views of the river below and surrounding Badlands painted canyons are breathtaking. A truly magnificent site, you do not want to miss! With wild life galore and a number of hiking trails, you’ll find so much to see and do in the area. Bison, turkeys, longhorn cattle, prairie dogs, deer, fox, elk, buffalo, and big horn sheep are just a few of the animals you may meet at the park. Check here for a further list of things to do within the park. Following a morning at the park, you’ll need to rest up and grab a bite. Head back into town and check out Siggys Sandwich, featuring fresh to order gourmet sandwiches, gyros, and salads. Voted one of the top 10 restaurants in North Dakota by Only In Your State, you can’t go wrong with whatever you decide to order – though their Chipotle Chicken Sandwich and the Chicken Shack Shootout are local favorites. If you’re in the mood for a sweet treat afterwards, grab a cone next door at Dub C’s Creamery. With a full belly and some morning adventures under your belt, it’s time to take in some Watford City history. Check out the McKenzie County Heritage Park, where you’ll find historic buildings of McKenzie County, including a trapper’s cabin, country school, blacksmith shop, homestead shack, law office, church, barber shop, and more. Afterwards, head over to the Pioneer Museum of McKenzie County and discover how and why the pioneers chose to settle in this area of North Dakota. When it comes to food in Watford City, you’ve got a bit of everything to choose from. Check out some of the city’s greatest dining options, including popular brewing companies and low-key pub grub. While we’ve highlighted our favorite things to do in Watford City, there is much more awesome to see. At StorQuest Self Storage, we thrive on the spirit of possibility and want to help you make the most of your daily adventures. Follow us on Facebook and Instagram to see even more great ideas for getting out and active this fall.